Sleeps 8 People plus child’s cot. Welcome to our ancient 4 bedroom newly renovated Trullo and villa with private pool, enjoying panoramic view over the Valle D'itria. Set in 5 acres of private peaceful countryside. Within easy reach of vibrant towns and beaches. Martina Franca and Ceglie Messapica are just 10km and provides all the amenities that you may need inc unlimited Internet. Enjoy our private 1.2m deep pool with 30cm shallow area for children. My wife and I visited Marina Franca in 2006, with a view to finding a summer retreat. We found Trullo Monted'oro which was in need of modernisation, we set about bringing the property up to date whilst maintaining the originality of the Trullo. As a property developer in the UK, I ensured that we prepared the Trullo to the highest standards using local materials and local tradesmen. With the summers so warm, it was essential that we included a swimming pool for our young children. We travel to the Trullo as often as we can and when not in use by us, make it available for others to enjoy. Trullo Monted'oro is quite simply Unique! An original 8 Cone Trullo, set on the crest of the valle d'itria with uninterrupted panoramic view of the surrounding countryside and hill top towns of Cisternino and Ostuni. In additional to its unique location, it is set back over 150m from a secondary road, just minutes from the main road between to popular towns of Martina Franca and Ceglie Messappica, where your peace and quiet are guaranteed. Unlike many trulli, which are traditionally farm building, our Trullo is NOT set in a field off an un-lit lane where finding your way home after an evening out is difficult. The Trullo, unlike many that are set in the middle of a field and accessed down a dirt track, Trullo Montedoro has a gated entry point just minutes from the main road between the main towns of Martina Franca and Ceglie Messapica making it easy to find, especially important to guest who do not know the locality. Trullo en-suite to bedroom 1 with shower, WC and basin. Trullo bathroom with shower, WC and basin. Villa bathroom with shower, WC and basin. All bathrooms have modern fittings and stylish tiling. Modern Leather sofa's, TV, Sky (Italia), DVD, Ipod docking station. Glass dining table adjacent to kitchen. Living room opens directly onto the large piazalle. Modern fitted kitchen in light oak with granite worktop, built in oven, hob, fridge/freezer, dishwasher, washing machine and microwave oven, Gaggia coffee machine, kettle and toaster. Outside we have a traditional pizza oven. A range of books are there for you. There is a 5 star Golf resort and spa awaits you near the fishing village of Savelletri near Fasano and the San Domenico golf course is approx 45 mins away. The villa has level access via a large piazalle with level access from the parking area, small steps provide access into the trullo, there are 3 steps leading off the piazalle and pergola onto the pool area. The pool has a maximum depth of 1.2m and has a shallow paddling area for small children. Please note the pool is closed Oct-May. Notes on accommodation: All guests will be met at the property on arrival where any questions can be answered. The trulli and villa have gas central heating (for use in winter months). The trulli's traditional design and thick walls ensure that it is kept cool in summer. The pool has a shallow area for all the family to paddle in. You may want to block access to the roof terraces to protect small children. Wine made by our neighbour can be made available upon request at €10 for 5 litres. Outside: The property is set back of the main road with private gates and is accessed via a long private drive. Situated in an elevated position with panoramic views over the Valle d'itria. Set in 5 acres of private land there is much for children to do. A pergola extends off the villa over looking the private pool where lunch can be taken with a glass of local wine. There is a traditional pizza oven for your use. Sun loungers and beach towels are provided for use around the the pool. The pool is 8x11m with max depth of 1.2m, a shallow area 30cm deep is provided for paddling and toddlers. We have table tennis table with bats and balls and there is also a double swing frame for small children. Cleaning / Towels / Linen / Maid service: A complimentary welcome pack is provided inc 5ltr Red wine. Towels, linen and pool towels are provided and changed weekly. Mid rental cleaning and/or more frequent towel and linen changes are available at cost. Other: The property is alarmed and is serviced by a local security company. Wonderful holiday in a beautiful setting! We were seven friends, 3 couples and a single. Paul and I went to Naples first and then drove by hire car to the villa. It is in a beautiful spot. The outside space is fantastic with a superb pool, one of the best we have used in a rental property. We love cooking using local ingredients and everything we needed was in the kitchen (except the hidden toaster so we bought another one!). The pizza oven was a great hit. The bedroom accommodation was more than satisfactory, as described but do read the information about local flora and fauna to avoid getting bitten. The housekeepers Martin and Sharron were brilliant; the villa was clean and well maintained, but we were without water for 48 hours- a long story involving hornets, faulty electrical panel, a defunct pump and delightful Italian workmen who left an outside tap running which emptied the just refilled cistern. Martin and Sharron were stars sorting it out as quickly as they could. thank goodness we had the swimming pool!!! We visited the beach at Lido Bizzarro (great beach not crowded when we were there as off season), Martina Franca (great market), Matera (stunning), Locorotondo(charming), Alberbello (touristy but fascinating), Lecce (historic) and of course Ceglie (good supermarkets and a pasticceria to die for!). We had a lovely meal at Cibus in Ceglie (recommended for meat fans) and drank copious amounts of lovely wine purchased in various places. The welcome pack included 5 litres of local red wine which was delicious; thank you. All in all we loved it and recommend this villa for a great family holiday. As we drove up the private drive on that beautifully sunny day I just knew we'd picked the right place for a quite, peaceful and totally chilled-out holiday. When we pulled up at the Trullo it looked amazing and the kids didn't take long to jump into the very inviting swimming pool. The Trullo had everything we needed and once the kids got used no wi-fi (and we found the local internet cafe 10 mins drive away!) the facilities were well used. A great selection of DVD's which kept them entertained in the heat of the midday sun and the Table Tennis Table which we had outside was well-used too. This just left the adults to chill-out on the sunbeds round the pool in lovely weather and stunning surroundings. We did venture out too and the surrounding towns of Martina Franca and Celglie were lovely as were our days trips out to Oustuni and Monopoli. All in all a lovely holiday in a lovely part of the world and great value for money. Fantastic...! So peaceful and relaxing. We couldn't believe that we had all this to ourselves, it was awesome...the trullo was just as it was described. If anything better..it was so peaceful and having relaxing. The kids loved the pool and we had everything we needed..(inc some great wine). We are thinking of booking again for next year. Thanks for a great holiday. 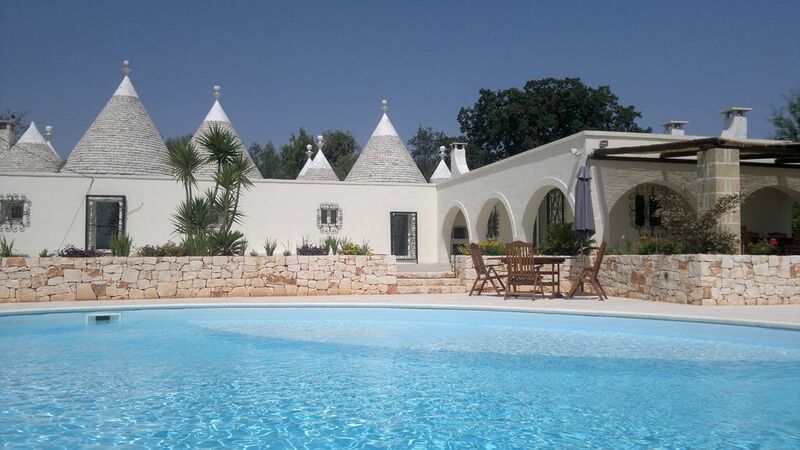 We have just returned from 2 weeks at the Trullo Montedoro. It is a truly amazing place, even better than the description on this site. It is so quiet you can hear planes flying over at 30,000 ft! It is the best equipped holiday home, we have ever stayed in! The pizza oven is brilliant- a real family bonding experience- making our own pizzas!The pool is fantastic- we used it a lot, but also visited several local towns for sightseeing. We ate every day outside, even in the heat of the day, the covered area was lovely. It was great fun watching the swifts drinking from the pool, trying to outdo each other! And stargazing at night- we saw 2 shooting stars, and 2 satellites in orbit. The Italians are so welcoming- we went to various local restaurants- and the food just kept coming! The couple who welcomed us, were full of information, and were quick to give advice when we needed it. Will definitely think about booking again next year. Thanks for giving us a superb, relaxing holiday, in a stunning setting! Wir sind seit 7 Jahren immer in der Region in einem Ferienhaus. Dieses mal war es jedoch das schönste Haus von allen. Auch das House Keeping war super. Danke Martin und Sharon. Vielleicht gehen wir nächstes Jahr wieder da hin ''?? We can arrange for you to experience local cooking classes, please email us if you require this as we will contact the organisers for available dates. The Adriatic sea is just 30 mins from Trullo Montedoro, with family beaches at Torre Carne and all facilities you need - including seafood and gelato! On the opposite coast, the Ionian, a 60 minute drive you will find stretches of open sandy beach with private lido' offering sun loungers and beach supervision at Campo Marino. Both coastlines offer large beaches and quiet coves, with beautiful clear blue water. Further south the shore becomes more rugged and dramatic. Trullo Montedoro is 40 mins from Brindisi or an 80 mins from Bari, the region is easily reached by Ryanair flights from London Stansted as well as regular flights from LHR to Brindisi via Rome and Milan. We recommend that you hire a car due to location of the property. Trullo Montedoro is easily found 1.5km off the SS 581. The historic towns of Martina Franca and Ceglie Messapica are approx 10km in either direction. Ostuni, is just 18km from Trullo Montedoro with the Centro Storico revealing great bars and restaurants. Alberobello - the trullo village is a 30 min drive. The towns of Martina and Ceglie are well served by banks, supermarkets, shops and restaurants. The virtually undiscovered region is rural with historic towns perched on the top of the many hills, painted white to reflect the glistening sun. Puglia is Italy’s largest olive oil producing region with olive trees in every garden it is easy to see why. Martina Franca has a local market every Wednesday and on Saturday in Ceglie selling locally produced goods from fresh fruit and veg, to clothes and shoes. The sun in July/August can be very strong, but with the weather being pleasant from May through to October there is plenty of time to explore this beautiful region. Booking Notes: A non-refundable deposit of 25% of the total amount must be paid within 10 days. Your reservation will be confirmed on receipt of your deposit. The balance must be paid in full, no later than 8 weeks before arrival. A refundable security deposit of £350 is required and refunded to your bank on confirmation by our agents of satisfactory hand over. Discounts available on remaining summer dates. Call or email to enquire. Changeover Day: Changeover days are Sundays, but can also be flexible depending on bookings- please email to confirm. Check in times are after 4pm on the day of arrival and check out times are 10am on the day of departure.